One approaches the first waterfall from the top of the falls. 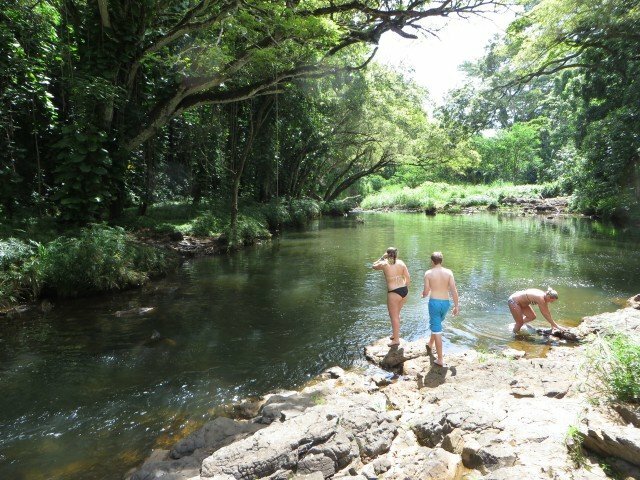 If you want to get to the pool at the bottom of the falls you must go downstream and wade back upstream or, if you are a real dare devil and have a local there to tell you if it is safe, you can jump in. Of course this is at your own risk and having someone check out the water first to make sure there is nothing dangerous under the surface is a MUST. Once back on the trail and heading downstream, you will parallel the stream. Please stay within 10 feet of the water (except in one area) in order to be on state land and not private property. The trail is relatively flat and covered with trees. Just before the second falls a side trail crosses the stream, but you should not take that trail. Near the top of the second falls the trail circles around to the right and descends to the bottom. This last section is short but steep and often times slippery. There are tree roots for you to grab onto. The scene below the falls is beautiful. The water is clear but cold. There is a hanging swing which, of course, both my grandkids and sister had to try. 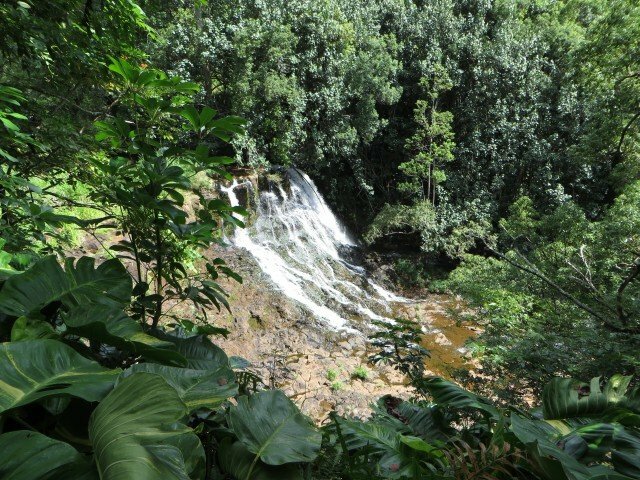 To get to Ho’opi’i Falls take the highway south from Princeville for about 30 minutes (just before Kapaa). Turn toward the mountains on Kawaihau Road (across from Kealia Beach), go by the high school and turn right at the dead end. 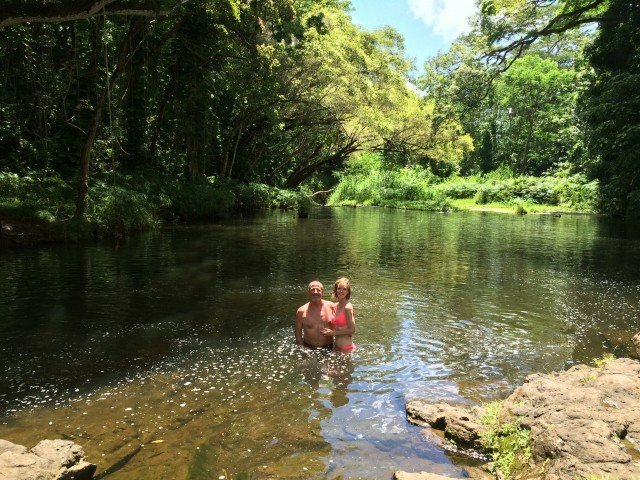 Continue toward the mountains for several miles until you come to Kapahi Road and turn right. An old public dirt road (now used as the trail) is on the left as you drive down Kapahi Road. Park along the street. Please be respectful of the neighborhood. Many residents are not thrilled with the influx of visitors invading their space. They do not want you driving faster than 15 mph. Favorite activity for our 20-somethings! Look for a power/telephone pole with a “Quiet” sign on it that’s maybe .25 mile BEFORE the private property – that’s where you want to begin. We went to the farther falls first where we hung out at the bottom for a little while & did the rope swing. Let someone who’s been there before do it first and show you where to drop. On the way back to the car we thought “what the heck – let’s see what the FIRST falls is all about” and that’s when the REAL fun began. With encouragement from Dad and REALLY STRONG opposition from Mom, 3 of the kids (21-23) decided to jump from the top of the falls into the water below. Again, let a “local” do it first. The kids loved it and jumped multiple times while Mom watched, video’d, and tried not to go into cardiac arrest. We didn’t see this on any of the travel sites we looked at, but the rental agent at Enterprise told us to go there! Fun way to spend a few hours, get a little exercise in (not strenuous at all), and all for free!! 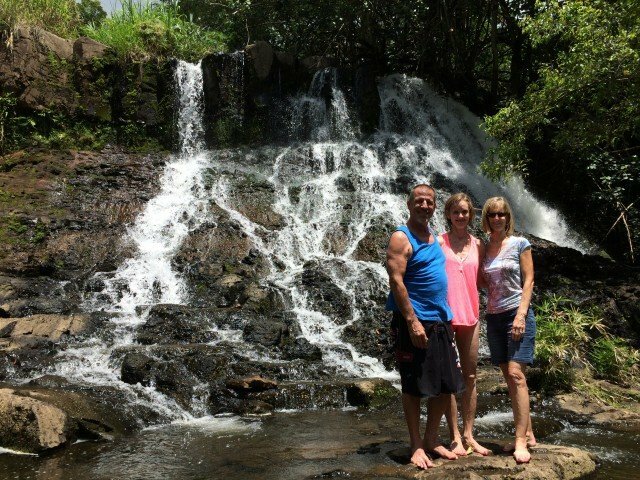 The first thing you will note, when hiking to any waterfall in Kauai is that because it is known as “The Garden Island”, it is lush and green which tells you it rains a lot more than other islands and therefore the trails are MUDDY. Be aware and be prepared. Wear the proper footwear. Most hikers we encountered were in bare feet. But no matter what you wear, the slope will have you slipping and sliding in a few spots and you will be gripping with your toes in others. In the Dry Season it may be OK but the falls will be just a trickle. There was plenty of water flowing during our visit, but the next week they had flash flood warnings and made everyone in low lying areas move to higher grounds. That would have been a site to see. But very tricky to get down to the falls. When you read the reviews and they say it is a short hike and ok Falls or minimal falls that is usually because they have stopped long before they get to the actual falls with the rope swing. They are not gigantic but they are beautiful. 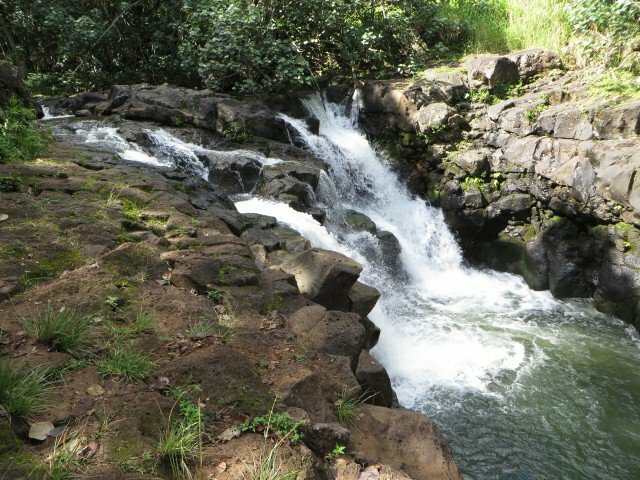 There are many trails that cut to the river and you can walk along the side of the river to the first falls, but that will not get you to the actual falls. You will have to come back and go further down the trail and if you stay beside the river you will get to the top of the 2nd falls. In order to get to the base of the falls, the rope swing and the swimming pond you need to be aware of where you are. You will hear the falls but not see them. there is a fork in the trail that is hard to notice overgrown about 50 yards before the falls. it clearly goes up and around the cliffs you will see at the top of the falls. Take that trail and keep your eyes and ears open. When you hear the falls below you, you will see a few alternative trails that are overgrown as shown in the trail pictures. You are on the right trail and it is worth the twisting and climbing to get down to the base and be able to play in the falls. Don’t worry there are plenty of trees and bamboo trunks to hang onto for going down and coming back up. Heading out will take you a couple of hours and going back you will cut the time in half. Allow 2.5 hours overall and you should be good. You can spend more time when you get to the pond. Also make sure you know what the weather is up to as you will be in a flash flood area and any rain will rise up pretty quickly and make the trail that much more difficult to get back on. PARKING. Watch for the hydro Pole that has the sign QUIET on it. That is your entry point. you can park on the street anywhere along that side. It is in a residential neighborhood so PLEASE BE RESPECTFUL AND QUIET. Tennis shoes are ok. Bring water, insect repellent, suntan lotion and your camera for some real Kodak moments. Enjoy. For more of my blogs or to subscribe go to the right-hand side of this page. Mahalo!